BASURGENCE ESSENTIAL ACTIVATOR STRESS PROTECT SOOTHING BOOSTER is a serum capable of fighting, from application, irritations and visible signs of environmental and emotional stress. These skin discomforts are illustrated by persistent and diffuse redness, the appearance of unsightly blood vessels and imperfections. BASURGENCE ESSENTIAL ACTIVATOR STRESS PROTECT SOOTHING BOOSTER offers an efficient and targeted solution to soothe the skin. From application, BASURGENCE ESSENTIAL ACTIVATOR STRESS PROTECT SOOTHING BOOSTER helps to soothe skin, reduce redness and protect skin against environmental and emotional stress factors. The skin's softness and elasticity are restored. It is visibly soothed and its radiance and serenity are restored. All LACURE OFFICINE products are formulated without parabens, silicone, MIT and phenoxyethanol. Apply morning and evening in light massaging movements all over a perfectly cleansed face and neck. 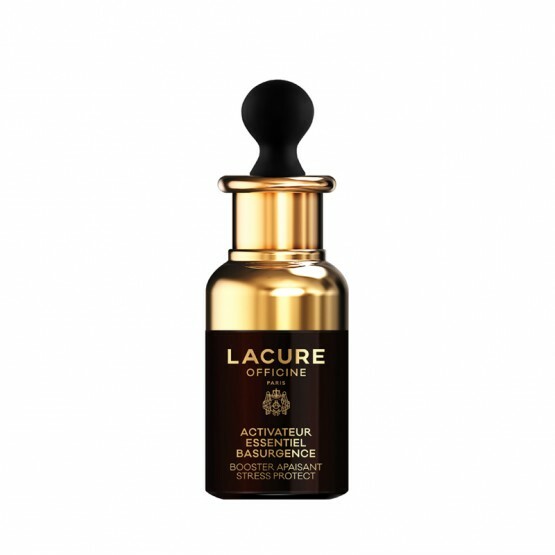 To optimise the product's efficacy, follow with LACURE OFFICINE.